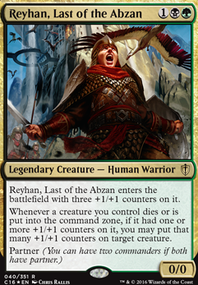 (1)(Green): Until end of turn, target creature with a +1/+1 counter on it gains "Whenever this creature deals combat damage to a creature, destroy that creature at end of combat." Some of these nonbasic lands are slowing you down quite a bit. In two colors, you really don't need this much fixing--especially if one of those colors is green. I would replace Simic Guildgate, Holdout Settlement, Shimmering Grotto, Vivid Creek, and Vivid Grove with forests. After that, I'd take out some of your weaker cards and replace them with ramp spells, because you don't have enough--especially with an average CMC over 3. These ramp pieces will also help you ensure you hit your colors: Rampant Growth, Sakura-Tribe Elder, Search for Tomorrow, Farseek, Cultivate, and Kodama's Reach. As for what to take out, I'd pick Simic Basilisk, Nimbus Swimmer, Aquastrand Spider, Simic Cluestone, Darksteel Ingot, and Forced Adaptation. These cards don't do enough for the mana you're spending on them, or they aren't as good as other cards you have. The mana rocks in particular really don't need to be in here if you can get extra lands out. Lands won't get wiped out by a Cyclonic Rift, Planar Cleansing or Vandalblast the way these artifacts can. If you add these ramp spells, you can also shave a couple of lands off to add some more draw, which you are also lacking. 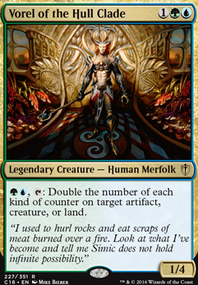 Arcanis the Omnipotent is a good choice if you want to play with Experiment Kraj's activated ability text. 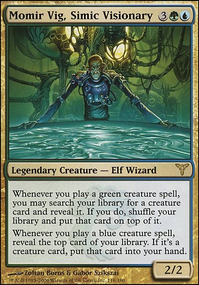 Aside from that, even the budget blue sorceries like Concentrate and Tidings do their job just fine. All that said, I like the deck a lot! I played with Ezuri, Claw of Progress for a while. Simic counters is a powerful archetype. landofMordor on The Braids of War! Hey friend, I'm loving this after your changes. I'd try Scarland Thrinax and Bloodflow Connoisseur instead of the Husk, since those do give counters. The changes you've made are also good. I LOVE Phytotitan and will be finding a spot for it in my build ASAP. Likewise, your 'walkers are both good. And it also looks like you've got enough finishers, too. Hope that helps! Weak spots as far as I can see are maybe Rakshasa death dealer, Fireshrieker. 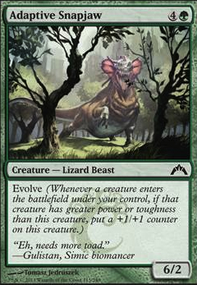 Try Ridgescale Tusker or Ivy Lane Denizen if you want more counter synergy. Or Nissa, Voice of Zendikar once she rotates out of Standard and drops in price. 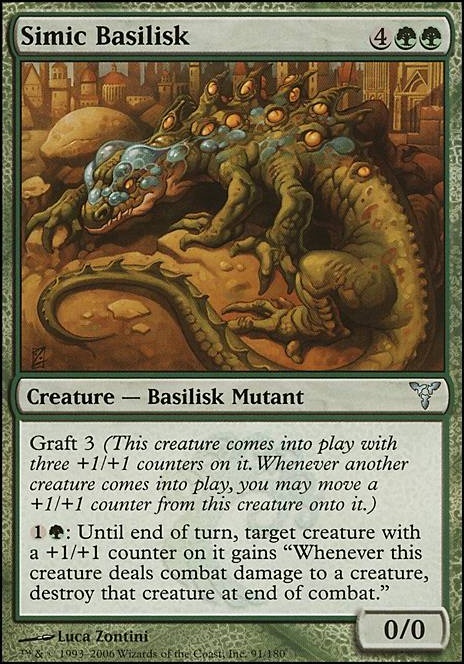 Other counter synergy is stuff with Graft, like Llanowar Reborn, Simic Basilisk, and others. I hit up Andy's, time for yours! His was a bit easier since I'm more familiar with the drain theme and such, so I'll throw some ideas out there and see what you like. Strict upgrade: Tezzeret's Gambit to replace Steady Progress since you can pay 1 life to make Gambit the same as Progress but draws an additional. Or run both! 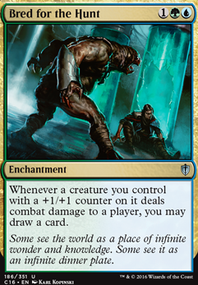 Also, since you're running it seems like ramp spells such as Cultivate and Kodama's Reach are really powerful cuz if you hit either on turn 3 you're starting turn 4 with 5 lands and for sure have one in hand - NASTY! I'd look to incorporate some of those as well.